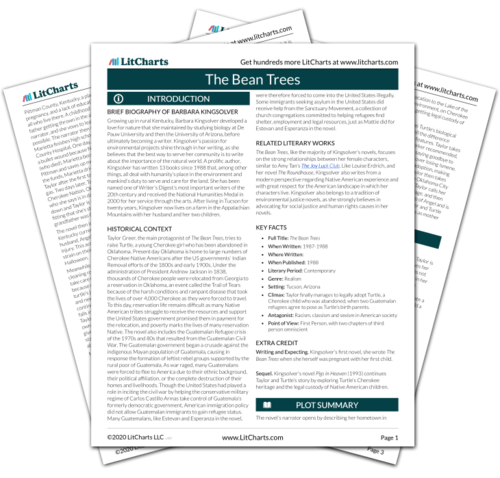 Instant downloads of all 942 LitChart PDFs (including The Bean Trees). Welcome to the LitCharts study guide on Barbara Kingsolver's The Bean Trees. Created by the original team behind SparkNotes, LitCharts are the world's best literature guides. A concise biography of Barbara Kingsolver plus historical and literary context for The Bean Trees. A quick-reference summary: The Bean Trees on a single page. In-depth summary and analysis of every Chapter of The Bean Trees. Visual theme-tracking, too. Explanations, analysis, and visualizations of The Bean Trees's themes. The Bean Trees's important quotes, sortable by theme, character, or Chapter. Description, analysis, and timelines for The Bean Trees's characters. Explanations of The Bean Trees's symbols, and tracking of where they appear. An interactive data visualization of The Bean Trees's plot and themes. Growing up in rural Kentucky, Barbara Kingsolver developed a love for nature that she maintained by studying biology at De Pauw University and then the University of Arizona, before ultimately becoming a writer. Kingsolver’s passion for environmental projects shine through in her writing, as she believes that the best way to serve her community is to write about the importance of the natural world. A prolific author, Kingsolver has written 13 books since 1988 that, among other things, all deal with humanity’s place in the environment and mankind’s duty to serve and care for the land. She has been named one of Writer’s Digest’s most important writers of the 20th century and received the National Humanities Medal in 2000 for her service through the arts. After living in Tucson for twenty years, Kingsolver now lives on a farm in the Appalachian Mountains with her husband and her two children. Get the entire The Bean Trees LitChart as a printable PDF. Taylor Greer, the main protagonist of The Bean Trees, tries to raise Turtle, a young Cherokee girl who has been abandoned in Oklahoma. Present day Oklahoma is home to large numbers of Cherokee Native Americans after the US governments’ Indian Removal efforts of the 1800s and early 1900s. Under the administration of President Andrew Jackson in 1838, thousands of Cherokee people were relocated from Georgia to a reservation in Oklahoma, an event called the Trail of Tears because of the harsh conditions and rampant disease that took the lives of over 4,000 Cherokee as they were forced to travel. To this day, reservation life remains difficult as many Native American tribes struggle to receive the resources and support the United States government promised them in payment for the relocation, and poverty marks the lives of many reservation Native. The novel also includes the Guatemalan Refugee crisis of the 1970s and 80s that resulted from the Guatemalan Civil War. The Guatemalan government began a crusade against the indigenous Mayan population of Guatemala, causing in response the formation of leftist rebel groups supported by the rural poor of Guatemala. As war raged, many Guatemalans were forced to flee to America due to their ethnic background, their political affiliation, or the complete destruction of their homes and livelihoods. Though the United States had played a role in inciting the civil war by helping the conservative military regime of Carlos Castillo Armas take control of Guatemala’s formerly democratic government, American immigration policy did not allow Guatemalan immigrants to gain refugee status. Many Guatemalans, like Estevan and Esperanza in the novel, were therefore forced to come into the United States illegally. Some immigrants seeking asylum in the United States did receive help from the Sanctuary Movement, a collection of church congregations committed to helping refugees find shelter, employment and legal resources, just as Mattie did for Estevan and Esperanza in the novel. The Bean Trees, like the majority of Kingsolver’s novels, focuses on the strong relationships between her female characters, similar to Amy Tan’s The Joy Luck Club. Like Louise Erdrich, and her novel The Roundhouse, Kingsolver also writes from a modern perspective regarding Native American experience and with great respect for the American landscape in which her characters live. Kingsolver also belongs to a tradition of environmental justice novels, as she strongly believes in advocating for social justice and human rights causes in her novels. Climax: Taylor finally manages to legally adopt Turtle, a Cherokee child who was abandoned, when two Guatemalan refugees agree to pose as Turtle’s birth parents. Writing and Expecting. Kingsolver’s first novel, she wrote The Bean Trees when she herself was pregnant with her first child. Sequel. Kingsolver’s novel Pigs in Heaven (1993) continues Taylor and Turtle’s story by exploring Turtle’s Cherokee heritage and the legal custody of Native American children. Mueller, Bethany. "The Bean Trees." LitCharts. LitCharts LLC, 19 Jan 2017. Web. 19 Apr 2019. Mueller, Bethany. "The Bean Trees." LitCharts LLC, January 19, 2017. Retrieved April 19, 2019. https://www.litcharts.com/lit/the-bean-trees.